Happy Customers - here are just some of the testimonials from our puppy homes! I want to let you know how Sway is doing. He is a super dog and is adjusting quickly. We are so pleased to have him. He is just as you said, completely house trained, crate trained and well behaved. It is so nice to walk him because of his leash training. He is well socialized with dogs and people. We can take him anywhere and he is confident and friendly. The same is true with visitors at our house. I would certainly purchase an adult dog from you again. Thank you so much for giving us the opportunity to have him. I know it was hard for you to part with him. *Breeder's Note: From time to time we retire a dog from showing and/or breeding. 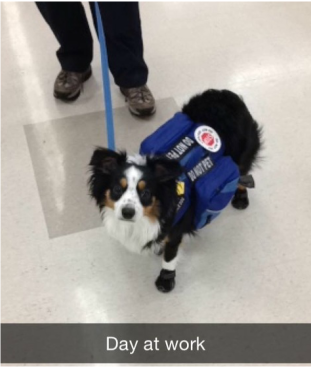 They are always well behaved and trained dogs. Be sure to watch our site for any in the future! These Sling Shot X Savvy pups on the day after (Annie's 3 days after) they went to their new homes! Theo was really good! Got up around 3 am. Had a little whining when we put him back in crate but then went back to sleep. He's already met lots of people and is such a love. Plus he already knows to go to the door and has made it outside to potty all but once! 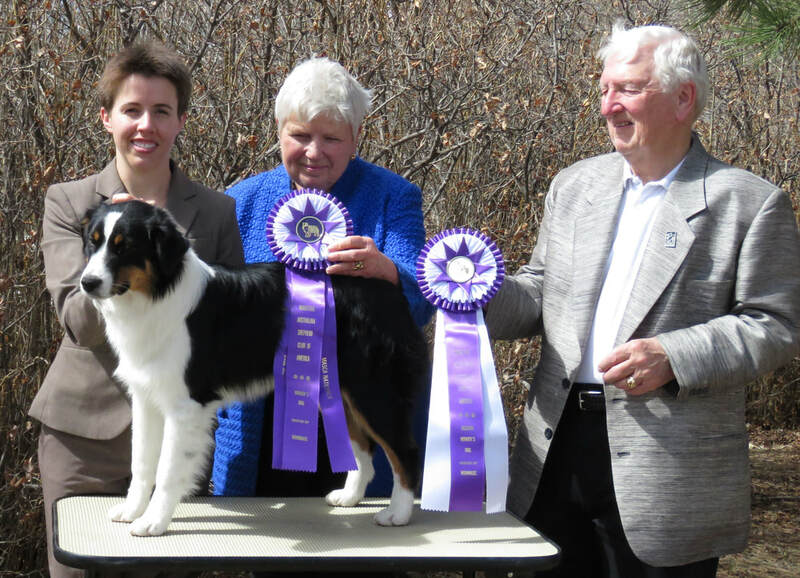 Loyal, black tri, sired by Sling Shot started her agility career with a bang! She finished out at under 16" so does her agility jumps at 12". 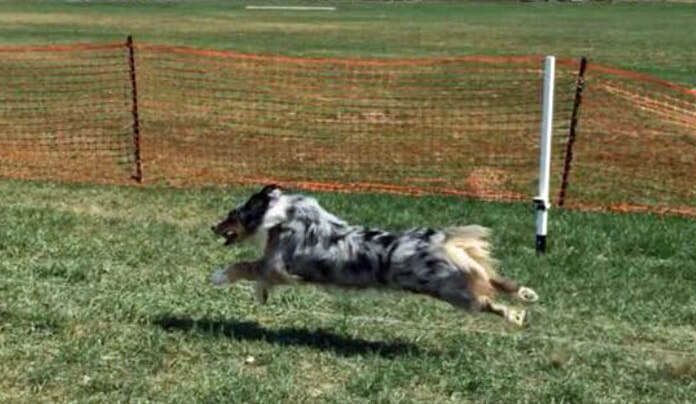 In November 2018 she is ranked the #1 Agility Dog Preferred!!! She got her Master Agility Excellent Preferred title and Excellent Jumpers Preferred in Dec 2017 at not quite 2 years old. Kyle's done a great job with her! "Sasha has the best personality as a companion, loves dogs, loves people, loves to please me! She is novice because of me, I am slow with my physical handicaps but she always does what I ask. As we compete both of our confidence grows. I have never trailed before so new to both of us! You have some beautiful awesome dogs at trials! I always recommend you whenever anyone asks me. You are a responsible Breeder, thank you. *Breeder's Note: Sasha has done fabulously for Dianne in Fast Cat and agility. She's just 3 years old, sired by Dexter out of Chatter. In November 2018 she is ranked #7 for Fast Cat! Somehow we missed 74 Ranch being in front of her name but when you see Sasha Ann's Starlight - it's her! Good job Dianne and Sasha! Hanna was a retired breeding dog, sold at about age 6. ​"Michele, just wanted to tell you what a gift Hanna has been to my brother. If you didn't know, you would think that they had been together forever. They spent the weekend with us, our children, grandchildren and all of our dogs this weekend. She is amazing!" her! We're headed to the ranch next weekend, that will be lot's of fun for her! Looking forward to see if she likes chasing the goats. I'll try to get a video to send to you." (update 11/12/12) "Michele, she is one smart cookie and keeps me on my toes! Here's something beyond cool, I have severe asthma and the smoke this summer was not good...when an asthma attack is eminent, Scout will give me warning. She will literally not stop touching me, in fact she will wake me up if I'm sleeping. She was not trained, she is just that perceptive"
Just wanted to update you and tell you how happy Alyson and I have been with Otis. He's such a joy! He has been surprisingly good for a puppy. Minimally destructive, VERY well behaved (does especially well with "leave it", shockingly), and does exceedingly well with all of his training. He struggles a bit with obedience when out walking, except for recall. We worked hard on developing a bullet proof recall and it has clearly paid off. He does recall AMAZINGLY. He's a total sweetheart with other dogs and people of all sizes. He is SO perfect for us though! He's loving and snuggly, loves to play and run around, but can also chill out and relax. He's clearly super attached to us, but also doesn't seem to stress out about being left alone for 4-6 hours at a time. He has bonded fairly equally to both of us (surprisingly so, really... I would have expected him to have a clear favorite but he doesn't seem to, which is awesome). It's really fun to watch Strider and him play together. "Griffin is the best. He's smart, funny, active (but not too active, he likes to be lazy as well), social, and a typical aussie velcro dog. His only negative is that he is deathly afraid of thunderstorms, he can feel them coming miles away. He's a beautiful dog, great coat and markings and weighs 35 pounds. He loves walks, squeaky toys, hiking, camping, 4 wheel driving, car rides - we take him everywhere. We can't thank you enough, he's a great dog and we are very happy to have him." Just a note to let you know that Liesel is doing great! She is still a show stopper wherever we she goes - everyone wants to pet her and talk to her. She received a pull toy from Santa for Christmas- we call him "Spot"..... and she is learning to pull it along, taking him for short walks! She attends day camp once or twice a week and has lots of fun interacting with the other dogs. They do lots of hiking, agility and swimming. Currently Liesel is learning to "dance"! It is located on about 70 acres. A great place for dogs to play and learn new things! She is the perfect size for us. She has been a great joy for us and we feel so fortunate that she is such a wonderful pet. "Barbie is doing great. She went in her crate at 10:00 and slept until 6:02. She is very good. She is eating and going potty outside. A few accidents today. We have so many bunnies and new things to see she is somewhat distracted when she goes outside. She follows me wherever I go and loves to be loved. Thank you so much for bringing her down and giving her such a great start. She is going to be a wonderful companion. I will keep you posted on her progress. Thanks!" (update Aug 2010) "I love her, she is the best dog ever. She is so smart and well behaved. We have completed all the puppy classes at Pet Smart and she was always the smartest and best behaved. I take her everywhere with me.and get many compliments on how pretty she is and so well behaved. I am thinking of doing agility training with her this winter. I check out your web site often... I love all your new puppies and have to restrain myself from getting another one. They are so cute!" "We're the ones that bought "Porky", the red merle male. We are loving the puppy's personality. He is very laid back and listens to us very well. He already comes when we call, sits and lays down. He's getting use to being around our cows and looks like he'll be aggressive when we start training him to heel cows. We sure enjoy him. Thanks again"
"Woody (now Crash) is doing great! He is very friendly, doing great with the family. Loves to play and then sleep :-) Took him to the vet today...clean bill of health, said he looks great. Asked for his breeder, hope okay I gave them your info and they are going to file it for people looking. He is doing so good with the potty training had only two little accidents with not getting poor guy out quick enough, me trying find my shoes he was busy playing with :-). He has traveled excellent too! We named him Crash. He is really enjoying the big snow banks but hasn't realized he's not as big as he thinks he is. He tries to jump to the top and misses. Its very cute Thank you so much for an amazing little guy." (update Sept) "I wanted to send you a couple pics of Crash (used to be woody). These were taken this last winter through to this Sept. He is doing wonderful, loves frisbee, and his all time favorite activity swimming! He has turned into such a handsome dog. He is approx 19" at his shoulder and weighs about 35-38lbs, very lean and muscular. Super well behaved, minus the teenage dog "Dad I am my own person, and I don't know why my bed popped and it stuffing is everywhere" Thank you for such a wonderful little man! "Coco has been the BEST dog so far that we have EVER owned! She's potty trained, gentle, loving, and playful. Billy can't wait to meet her! She's virtually potty trained, very affectionate, learned to walk on the leash in 1 day,and great with the kids. She's quiet all night now and just such a joy. Thank you so much for her!" "Shelby is sweet. She loves everyone, and swims in the pool. She is very brave especially for her age. I love her personality. She sits, lays and fetches a little too. I think she will be the boss of my older mini as she gets a little bigger. Although Shelby and my son are not old enough for 4H this year the dog obedience/agility leaders are going to let him go to the meetings this year so Shelby will be ready next year. I will let you know how she does and send a picture." "Cooper is doing well. He is gorgeous! An absolute charmer. He really is a natural with cattle! Very willing to work! Great instincts!!! He has A LOT of bone. VERY beautiful. Excellent movement." "HI Michele! Wrangler has us all wrapped around his paw! He’s so cute, and so good. He’s grown, but actually doesn’t look like he’ll end up very big, which is perfectly fine with me, and now my husband agrees cause he’s so cute right now. We’ll be thrilled whatever size he ends up. And I love your website…. Bet you can’t own just one. We’ve already been talking about that!" "Dakota is doing really well. I'm still having to fight my mother-in-law over her. She fell in love with her on the trip home. She is so beautiful. Thank you ever so much for raising such a great little girl. She is such a lover. Always wants to be in your lap. She greets you when you come home. If she goes out to check cattle, she runs in and gives you loving. She loves being at home, and she loves being with her people. We changed her name to Sundance. She really is something else. Thanks again." "I thought you might be interested to hear from us about our times with Kirby. He looks a lot like his dad, standing at a 15". We have so enjoyed Kirby. He is full of energy (but not too much), and is curious, very smart and is eager to learn. When we went to puppy training classes, the trainer said he could be a champion if we wanted to put in the work. Kirby's favorite things to do include, fetching the frisbee or ball, "nip and run" at the dog park (he likes to see if he can get the other dogs to chase him around), and sleeping. I hope all is well with you and yours. We really enjoy Kirby Boy. Regards." "Hey Michele! We could not be more happy with Hustle. He is perfect. Slept great throughout the night, goes potty outside. And has quickly adapted to me as his Momma. Don't be surprised if you get a bunch of calls from people in Aspen, as everywhere we go people stop and ask where I got him. We are soulmates! Thank you again! I will give you photo updates soon!" "So we named the pup Bentley. He is doing great with potty training no accidents at all in the last few days. He understands “come” and we are working to teach him to sit and lay down. Everyone who meets him just loves him. He went to a backyard BBQ with me last weekend and he was the life of the party. Pretty much everyone there took a turn holding him and getting puppy kisses." "Michele, I thought you might enjoy the picture of Nick and Pollux (Butch from Blue X Chester). 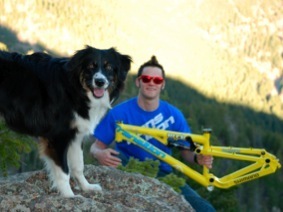 This is a photo from Nick's web site for his sponsors of his pro-bike career. Pollux is quite famous on the mountain bike tour!" "Hey Michele, I thought you might like to get an update on Skye, aka, Squirt. It has been about a year and a half with her and she is doing great. She is such a wonderful dog and has been a great addition to our house. My kids have the greatest buddy ever!!"